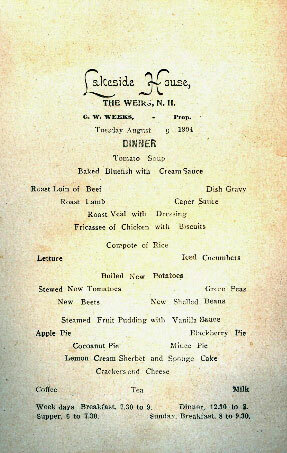 Dinner menu, dated August 9, 1904, listed the following available for consumption: Tomato Soup. Baked Bluefish with Cream Sauce. Roast Loin of Beef. Dish Gravy. Roast Lamb. Roast Veal with Dressing. Fricasse of Chicken with Biscuits. Compote of Rice. Lettuce. Iced Cucumbers. Boiled New Potatoes. Stewed New Tomatoes. Green Peas. New Beets. New Shelled Beans. Steamed Fruit Pudding with Vanilla Sauce. Apple Pie. Blueberry Pie. Cocoanut Pie. Mince Pie. Lemon Cream Sherbet and Sponge Cake. Crackers and Cheese. Coffee. Tea. Milk. Breakfast was served from 7:30-9; Dinner from 12:30-2; Supper from 6-7:30. Sunday breakfast was served from 8-9:30. 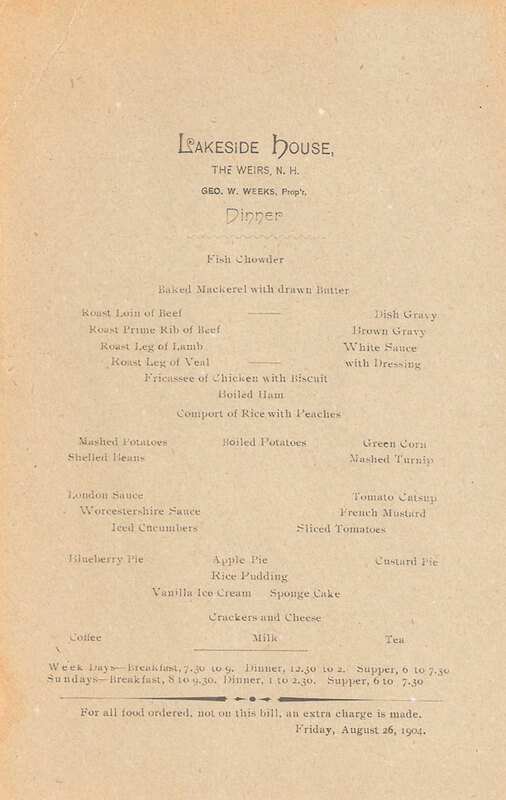 An even earlier, Lakeside House supper menu, dated August 19, 1900. 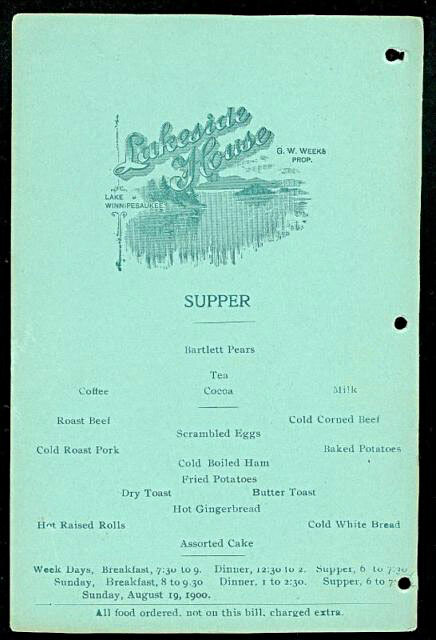 Notice how much simpler this menu is then the dinner menus, seen above.